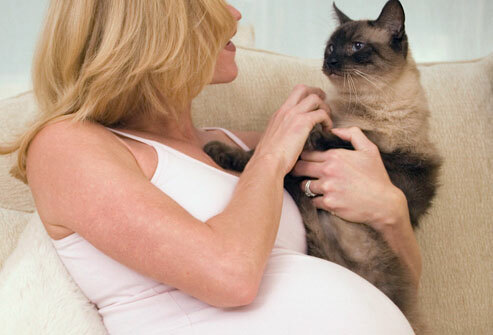 Veterinarians say that since it’s only new exposures to the parasite that cause problems, pregnant women who have shared their homes with the same cat or cats for a long time have even less cause for concern. The first time a cat gets infected he sheds the parasite through his feces and then develops immunity and never sheds it again. Family members who have lived a long time with the same cat have likely been exposed years before and so there’s no concern for new exposure. Have someone other than the pregnant woman clean the litter box. If the pregnant woman has to clean the litter box, always wear gloves and always wash hands with soap and water afterward (also wash hands thoroughly after exposure to soil, sand, raw meat, or unwashed vegetables). Changing the litter box daily provides protection against toxoplasmosis as the parasite doesn’t become infectious until one to five days after it is shed in a cat’s feces. Wear gloves when gardening or handling sand from a sandbox. Wash hands well afterward. Keep sandboxes covered when not in use, to avoid contamination by cats. Feed cats only canned or dried commercial cat food, never undercooked or raw meat. Do not bring home a new cat, especially one that might have been an outdoor cat (exposed to rodents or birds), or one that might have been fed raw meat.